Join us as we move and groove to the sounds of the 1960s! 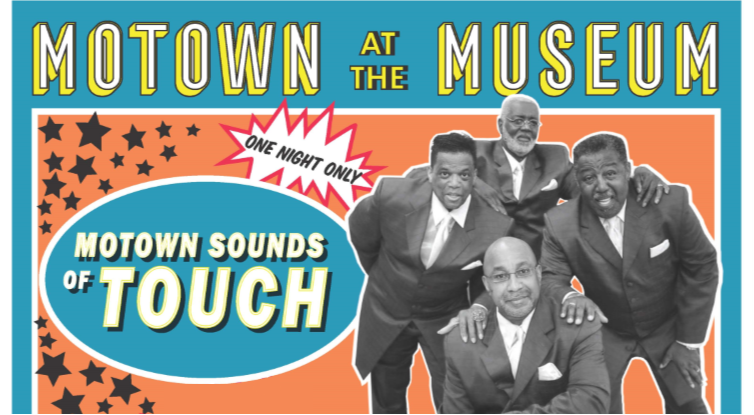 This fundraising event will be held in the emptied Pennyroyal Area Museum and features the Motown Sounds of Touch, a four-man singing and entertaining group who perform your favorite Motown smash hits. Known simply as Touch, this group has been entertaining and delighting audiences all over the country for over 15 years. Their energetic dance performances and engaging personalities have brought many audiences to their feet. They have shared center stage with the likes of Al Green, the Temptations, Night Ranger, and the Spinners, and they sing smash hits from artists like the Four Tops, Earth, Wind, & Fire, Stevie Wonder, the Commodores, and so much more. We will have soulful snacks, a cash bar, photo booth, and information to share about our big renovation. Dress the part, put on your dancing shoes, and get ready for this night of music and memories! This event harkens back to the local night club scene of the 1960s when world-famous acts played right here in Hoptown as part of the Chitlin Circuit, and it offers a perfect opportunity to capture more of our community’s history. If you have any pictures, documents, high school yearbooks, or other artifacts related to Hopkinsville and Christian County in the 1960s, please contact the Museums of Hopkinsville. Tickets are $50 per person. Buy online at Motown at the Museum Tickets or in person at the Visitors Center (1730 E. 9th Street). All proceeds support the Museums of Historic Hopkinsville-Christian County and its renovation project. For more information, contact the Museum at (270) 887-4270. So put on your best threads and grab your old man or old lady for this evening in Hitsville, USA. Can you dig it?